This mod will allow you to become one of the Avengers, or rather, the Ant-Man. This mod adds the Ant-Man suit. Crafting is pretty simple, you need to have at least an iron pickaxe (or mod that adds a pickaxe, which are stronger than iron pickaxe). ID480 (breastplate); ID481 (helmet); ID483 (boots). Mo’ Pickaxe mod for Minecraft PE 0.12.1/0.12.2After installing this mod you get 31 new picks. Each of the new picks has its own characteristics, such as a certain strength and appearance. Deconstruction mod for Minecraft PE 0.12.1Deconstruction mod adds unusual crafting table to the game, the crafting going in reverse. 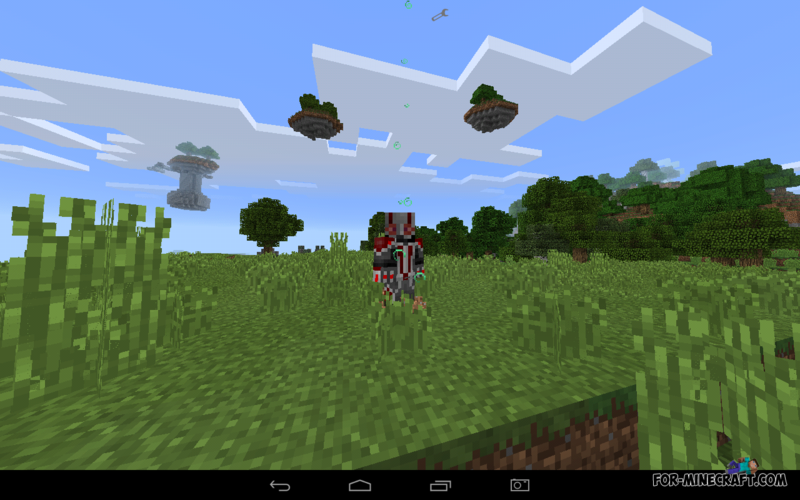 Exo Suits Mod for Minecraft PE 0.11.XThis modification will add the Exo suit from the Call of Duty: Advanced Warfare.